I’m going to sneak one last summer recipe in here folks, even though its September already! I feel like there are a million ice cream and popsicle recipes that I just haven’t gotten to yet, but my fall recipes from past years, like this yummy apple bread are already getting more hits. That means you’ve spoken my dears and I’ll change my focus to fall from here on out! 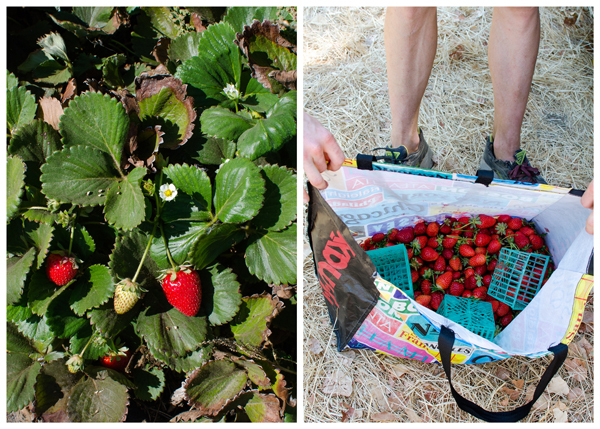 The reason I couldn’t resist talking about strawberries today is because we had a recent bounty of fresh-picked strawberries courtesy of our own labor that we picked on recent trip to Eatwell Farms for their tomato sauce canning party. 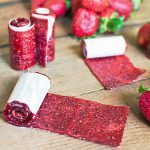 I made several pints of old fashioned strawberry jam and with the leftovers I made a batch of homemade fruit leather. 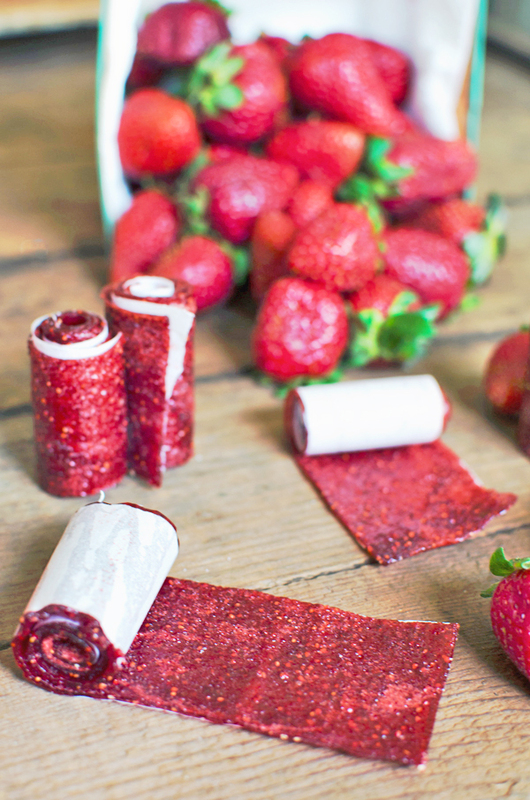 Similar to my fruit snacks obsession, fruit leather is also high on my list of favorite snacks. I’ve also included suggestions for other fruits as well. You can make this recipe with something that is a bit more seasonal, like apples! I talked a little bit about the amazing things that Eatwell Farm is doing in a previous post, but I just wanted to say again how blown away we were by what they’re up to. Everything from rotating crops to treating animals more humanely is done on a new level. Right now Eatwell is in the middle of a campaign to make poultry more humane across the nation. They are breeding a cruelty-free, dual-purpose (meat and eggs) heritage flock that is pasture raised from egg to adult right on the farm. You may not know this, but traditionally, flocks are traditionally born away from the farm and shipped in and males are often shredded right after hatching. It’s absolutely nauseating. Makes a standard size baking sheet. Puree the fruit, sugar and lemon juice in a blender. In general most fruits need about 1 tablespoon of lemon juice but apples and bananas may need 2. Bring the pureed fruit to a simmer in a medium saucepan over medium-high heat. Reduce heat to medium low and cook, stirring frequently, until the mixture thickens, about 35-45 minutes. Pour mixture out onto a parchment paper-lined baking sheet and spread into a thin layer. Bake at 175 F until just set, about 4-4 1/2 hours. Let cool completely, then peel off parchment paper. If still moist, you can return it to the oven, moist-side up and cook until dry. 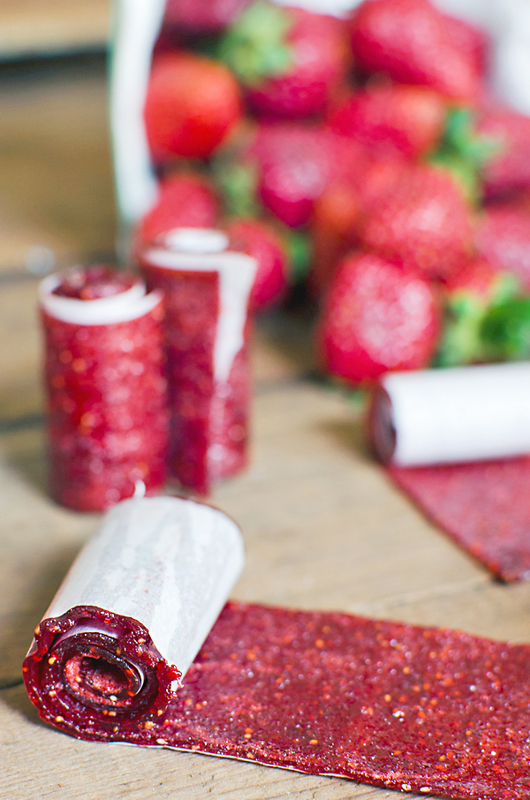 Place the dried fruit on a sheet of parchment paper and use kitchen shears to cut it into strips. Roll up the strips and store in an airtight container for up to 2 weeks. Tips: If you have the option to convect bake, use it and it will speed up your drying time a bit (about 30 minutes). Eatwell Farm is one of my lovely sponsors but all opinions (and enthusiasm) are my own! Thanks for supporting this awesome local organic farm. Sponsored posts allow me to keep producing creative and original content! Thanks! I guess they can be transitioned to fall with apples or pears, right? I didn’t even think to mention that! I think I need to go buy up the last of the strawberries at the market to make this! I could nomnom so many of these while writing. You should! You can also make this with more seasonal fruits as well! Kelly! your blog is amazing! – i’m so happy i finallllly checked it out. i’m so inspired to check out eatwell farms and the curry quinoa from your big sur post also looks so good! Good lawwwd, those look delicious. This is such a fun partnership post — nice work! Haha – they are delicious, I promise! Thanks so much! What temperature do I bake them at?